Michele Marie Amble Bachmann is a Republican Congresswoman representing Minnesota. She was born on April 6, 1956 in Waterloo, Iowa. 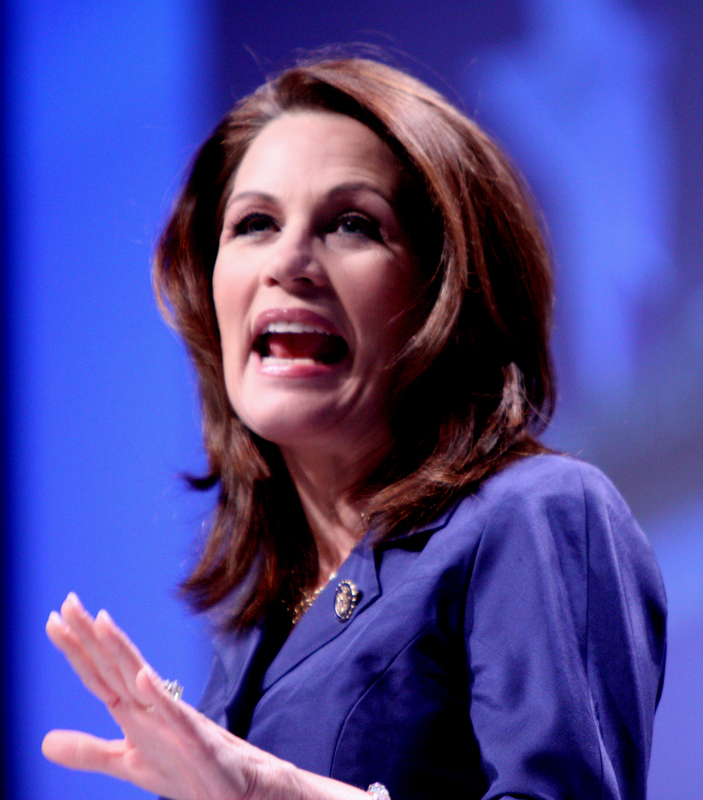 Bachmann moved to Anoka, Minnesota with her mother after her parents got divorced when she was around 13 years old. Bachmann attended the Oral Roberts University O.W. Coburn School of Law and then earned her L.L.M. in tax law from the College of William and Mary. In 1988, Bachmann became a civil service federal tax litigation attorney in St. Paul, Minnesota, for the U.S. Treasury Department branch located there. However, she became a stay at home mom while pregnant with her fourth child in 1993. Bachmann began her political career at the local and then state level as she became increasingly involved in the conservative movement. Bachmann first ran for office in 1999 where she unexpectedly won the GOP nomination against the incumbent, who had held the office for the previous 18 years. She then won the election to become Minnesota's Senator from the 56th district in 2000. In 2006, she became the first Republican female member elected to the U.S. House of Representatives from Minnesota. Bachmann sits on the Permanent Select Committee on Intelligence, as well as the FSC (Financial Services Committee), and she hosted the first Tea Party Caucus meeting. Her political platform is based on lowering taxes and reducing government involvement in everyday life. Michele Bachmann's family history can be traced back to Norway, where her great-great-great grandparents resided in Sogndal. Their names were Melchior and Martha Munson, and they settled first in Wisconsin in 1857 before eventually moving to Iowa. Bachmann and her husband Marcus, over the years, have taken in 23 foster children. Their passion started early for helping teenage girls who had become pregnant, and they made up the majority of their foster children. In addition, the Bachmann's have five biological children! Although Bachmann initially continued working while having her first three children, by the time she was pregnant with her fourth, she decided to be at home to raise her children and even took on the responsibility of homeschooling them. Her children are: Lucas, Harrison, Elisa, Caroline and Sophia. Bachmann's early Munson ancestors that came over from Norway included a young baby, Halyor Munson, who was born in 1846 in Norway and was one of five siblings who accompanied their parents on the voyage that ended in Wisconsin. Halyor served for three years in the Union Army after the family moved from Wisconsin to the Dakota Territory. Halyor continued to work for the government even after his family subsequently moved to Iowa, although he rejoined them finally in 1867. Halyor's brother Thomas fathered Anna Munson, who married Jesse Alvin Amble, Bachmann's grandfather in the early 1920s. This is when part of her family relocated to Minnesota, where the Amble branch of the family was originally from. Interestingly, Bachmann spent time working on an Israeli kibbutz (typically a collective farming community modeled after "utopian" visions of an equal society) after graduating high school in Minnesota. Her husband, Marcus, is a clinical therapist, and together, they own a mental health practice in Stillwater, Minnesota. This business has approximately 50 local employees. Bachmann is also a partial owner of Marcus' family Wisconsin dairy farm since the death of Paul Bachmann, Marcus' father. In fact, the couple was married on that dairy farm in 1978. Bachmann's family history is notoriously aligned with the democratic party, and Bachmann herself considered herself a democrat until college, when she switched to the GOP. Bachmann says that her grandmother, Anna Munson Amble, stood out as a republican and continuously spouted her political views to her democratic family. Anna Munson Amble apparently educated herself about politics and business by reading the Wall Street Journal. Bachmann joined other parents in Stillwater to form a K-12 charter school, called New Heights, in 1993 that was in direct response to state-mandated education initiatives. Although Bachmann is no longer on the board for this school, it was the first public charter school started in Minnesota. Also, Bachmann became the first woman to represent Minnesota in Congress, and she is hoping to further add to her family history by winning the 2012 presidential election and becoming the first female president. Bachmann's family history has direct connections to the rural farms that sprang up as settlers arrived in the U.S. from various locations around the world. Although she maintains ties with her husband's dairy farm and even spent some time directly after their marriage working on the farm, she ultimately found her calling in politics and plans to continue pursuing this calling, whether she does it from Minnesota or Pennsylvania Avenue.